Twitter today released the second update to its Twitter #Music app for iOS. You can grab the new version now directly from Apple’s App Store. That last one is of course where things get interesting; many artists like to support each other with a simple public display on the social network. Now, there’s a greater potential the gesture will translate into more fans. On the other side of the recommendation engine, the app now scans the music library on your device (Twitter specifically says iPhone, but there’s no reason why this shouldn’t also work on an iPod touch or iPad) and also keeps track of artists that you’ve tweeted about. Again, the idea is to bring Twitter and Twitter #Music ever closer together. We’ve added a bunch of new ways of discovering music. Listen to artist’s top tracks, similar artists, and the artists that your favorite artist follows on Twitter. 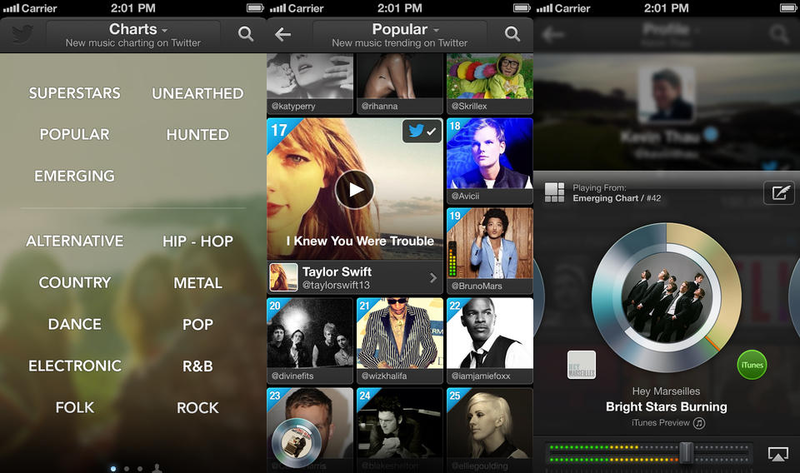 We also scan your iPhone’s music library now to suggest more relevant artists to you. And we show you the artists that you’ve Tweeted about so you can always get back to them. Finally, we’ve localized #music into all of your favorite languages. If you’re one of those good looking people living in Belgium, Denmark, Finland, France, Germany, Italy, the Netherlands, Norway, Portugal, Spain, Sweden, or Switzerland then we’ve got you covered! That last part is a total of 12 new countries, all of which are in Europe. Twitter is slowly but surely ramping up the app to support all the languages the social network does. As we said when the last update was released, there still doesn’t appear to be a Twitter #Music app for Android. We’ll let know when that starts to change.